A NASA probe that has been cruising through space for more than six years is poised to arrive at Mercury Thursday (March 17), and the excitement is building among scientists with each mile that brings the spacecraft closer to the rocky planet. When NASA's Messenger probe arrives at Mercury, it will become the first spacecraft in history to orbit the solar system's innermost planet. Researchers have spent 15 years developing the mission, so the maneuver to fire its engine Thursday and enter orbit around Mercury will be a huge moment for the mission team, scientists said. 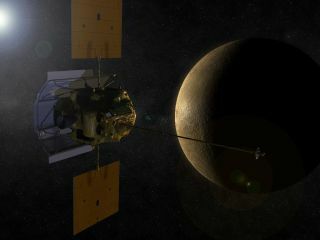 The $446 million Messenger probe, whose name is short for MErcury Surface, Space ENvironment, GEochemistry and Ranging spacecraft, launched in August 2004. Over the past 6 1/2 half years, the probe has taken a circuitous, 4.9 billion-mile (7.9 billion-kilometer) route through the inner solar system, completing one flyby of Earth, two flybys of Venus and three flybys of Mercury in the process. At 8:45 p.m. EDT Thursday (0045 GMT March 18), Messenger will fire its main thruster for about 15 minutes, slowing itself down enough to enter into orbit around Mercury. This operation will be the most complex one the refrigerator-size spacecraft has performed during its years in space, but the flybys and other maneuvers have helped prime the probe and its operators, scientists said. "The team is practiced, ready to go, and the spacecraft is as well, and all the instruments," said Messenger mission operations manager Andrew Calloway, of Johns Hopkins University's Applied Physics Laboratory (APL). If all goes according to plan, the spacecraft will spend the next year studying the desolate, scorched planet from on high. The main goal is to map Mercury's surface in detail, as well as investigate the planet's composition, magnetic environment and tenuous atmosphere, among other features. Scientists hope Messenger's observations will help them better understand how the solar system — and, in particular, rocky planets like Mercury, Venus, Mars and Earth — formed and evolved. The probe is returning the first new spacecraft data from Mercury since NASA's Mariner 10 mission in the 1970s. The mission team should know by about 10 p.m. EDT Thursday (0200 GMT Friday) whether the orbital insertion maneuver worked, researchers said. Success is never guaranteed with such a complex operation. Japan's $300 million Akatsuki spacecraft, for example, failed to enter into orbit around Venus in December after six months of interplanetary travel. Its thrusters were supposed to fire for 12 minutes in an orbital insertion burn, but they conked out after just 2 1/2 minutes. Akatsuki is still circling the sun, waiting for a possible opportunity to make another orbital insertion attempt in late 2016 or early 2017. Messenger scientists said they have contingency plans in case Thursday's maneuver doesn't work — but of course they hope those plans stay on the shelf. So their enthusiasm and eagerness are likely tinged with a bit of anxiety. "We're all not sleeping," said Messenger propulsion subsystem lead Carl Engelbrecht, also of APL. "We're very excited, very excited." You can follow SPACE.com senior writer Mike Wall on Twitter: @michaeldwall.SPACE.com for the latest in space science and exploration news on Twitter @Spacedotcomand on Facebook.